yellow tail w/daikon flake with spicy wasabi balsamic yuzu sauce. & onions with wasabi vinegar sauce. jalapeno & wasabi vinegar sauce. Thinly sliced fresh tuna with baby greens & balsamic yuzu sauce. Thinly sliced yellow tail with baby greens & balsamic yuzu sauce. Served with asparagus & special butter sauce. 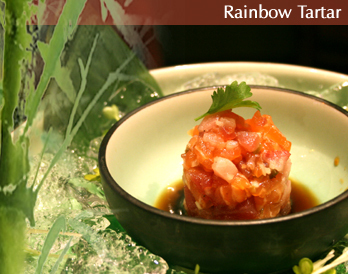 Served with Tuna, Salmon, Snow Crab & spicy Yuzu lime sauce.